Add Extra Space with Alan's Garages. Maryland Delivery and Installation for Free. Alan's Factory Outlet offers a wide variety of metal garages in Maryland. Steel storage units and workspaces are strong metal buildings in Maryland. Steel tubing, 4' in the center gives these building stability as they are fully braced. These structures are delivered and installed for free throughout all of MD. Although a lot of properties are designed or sold today, with a garage or storage space located on the premises, many are not. It may be the case that the building on the property is older and was constructed when houses didn't always come standard with garages. Maryland has a varied selection of historic and new construction and whether you're looking for Amish built sheds, or metal garages, Alan's has something for you. 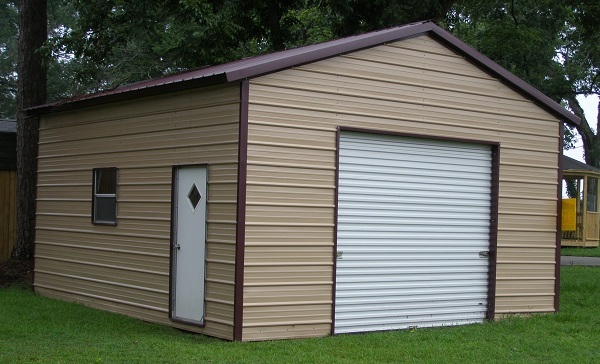 A quick way to create extra space on a property is with steel buildings. Maryland homeowners can add on metal garages from Alan's, which are custom built in the size, style and leg heights that fit their specifications. Having the perfect garage with your choice of: appearance, overall size, and garage door or garage doors, has never been as easy and affordable as it is with Alan's Factory Outlet's garages. Maryland residents can design portable storage buildings, garages or even carports that will work best with their personal or commercial needs. You also get to pick the roof color, trim color, sides and ends from a selection of 13 different colors, all made of steel. Maryland garages can now match the landscapes' beauty. Alan's sheds, garages and carports are perfect for coastal states, durable, weather resistant buildings made of steel, Maryland families can rely on. Save time and money and skip the box stores, order direct from Alan's for the highest quality, customizable steel buildings. Maryland residents enjoy free delivery on metal garages and car ports.